The parish of Our Lady and St. George was founded in 1949 and a brief outline of its early history is best served by reading here from the silver jubilee celebrations in 1974. 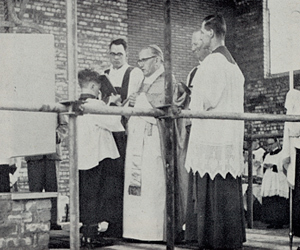 On Thursday 8th May, 1958 at 7-30pm Archbishop Campbell laid the foundation stone of the new church. Father Charles Sheridan and Father John Tobin assisted the Archbishop as deacon and subdeacon. Father Morgan of the Cathedral was M.C., assisted by Father Maguire. The Parish Priest Dr. Meechan, was in general attendance, ably supported by Mr. John Corrigan and the pass-keepers. A choir of priests, conducted by Father Wilkinson, provided the music for the ceremony. Many dignitaries, including Monsignor James Ward, V.G., and Monsignor Clapperton, were present, and a large number of priests honoured us by attending. The foundation stone is built into the arch on the Gospel side of the sanctuary. Even though the weather was atrocious – the fog was so bad that visibility at the most was 50 yards – there was a great number of priests and people present and we were honoured by the attendance of Bishop Black of Paisley and Bishop Hart of Dunkeld. His Grace Archbishop Campbell was piped from his car to the house St.Francis’ Pipe Band, and our own Scouts and Cubs provided a guard of honour. Assisting the Archbishop in the sanctuary were Monsignor James Ward, V.G., and Canons Ward and McGoldrick ( assistant deacons ). Father John O’Riordan, who looked after Penilee when it was part of the parish of Our Lady of Lourdes, was deacon and Father John Tobin, subdeacon. Father William Morgan was M.C. and Father Maguire assisted him at the altar.